This entry was posted on Saturday, 1 January, 2011 at 12:20	and is filed under Star Trek. You can follow any responses to this entry through the RSS 2.0 feed. You can skip to the end and leave a response. Pinging is currently not allowed. After Kirk saves the day, Spock tells him: “Dazzling display of logic”. 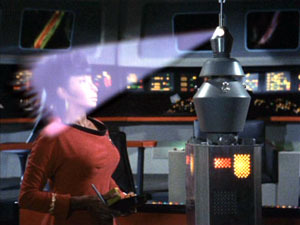 When Uhura gets frustrated with her “lessons”, she reverts to jabbering in Swahili, even though her “mind has been wiped clean”. I guess Nurse Chapel snuck in some Swahili lessons while she was at it.